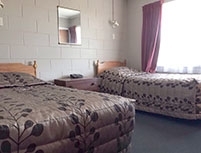 Otorohanga and Waitomo Motels provide a traditional New Zealand self-contained accommodation experience. 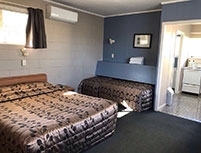 Our 12 motel units include studios, 1-bedroom and 2-bedroom units, serviced daily. 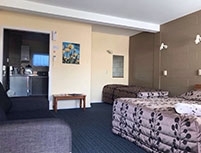 A swimming pool, spa pool and a children's play area ensures your time spent at Otorohanga and Waitomo Motels is bound to be memorable. 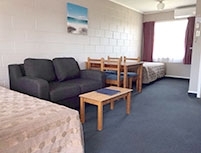 We offer guest laundry facilities, Sky TV and Freeview, ample off-street parking and a charge-back facility with local eateries. Continental and express breakfasts are available and we can arrange in-room a la carte evening meal delivery service if required. FREE WIFI. A self-contained economy studio with kitchen and bathroom. Contains 1 queen-size bed and 1 single bed. Parking right outside unit. A spacious studio unit with separate kitchen and bathroom. Has 1 queen-size and 1 single bed. Quiet, rural outlook. Parking right outside unit. Standard 2-bedroom unit with kitchen and bathroom, ideal for families with small children. Has 1 queen-size and 3 single beds. Parking right outside unit. Comfortable and affordable. Spacious family unit, sleeps up to 7. 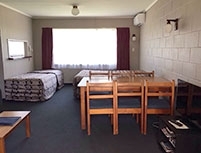 Has 1 queen-size and 1 single bed in bedroom plus 1 double-size bed and 3 single beds in lounge. Separate kitchen and bathroom. Parking right outside. A spacious 1-bedroom unit that has 1 queen-size bed in bedroom plus 2 single beds in the lounge. Separate kitchen and bathroom. Parking right outside unit. 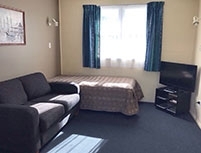 A spacious 1-bedroom unit that has 2 single beds in the bedroom plus 2 single beds in the lounge. Separate kitchen and bathroom. Parking right outside unit. $109-$139 for 2 persons, inclusive of GST. Special family and senior-citizen rates available.